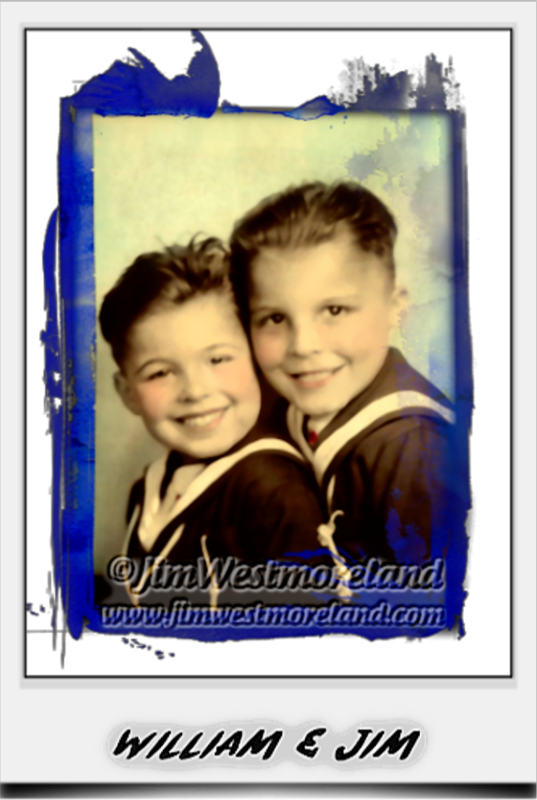 Jim Westmoreland burst onto the scene and into his first stage lights as, James Patrick Westmoreland on November 25, 1935 in Dearborn, Michigan. His maternal grandfather, George Chelarue, left Romania for America by ship and arrived at Ellis Island, New York Harbor, in 1912 to begin the family in America. George secured employment at the Ford Motor Company in Dearborn, Michigan and sent for the rest of his family. 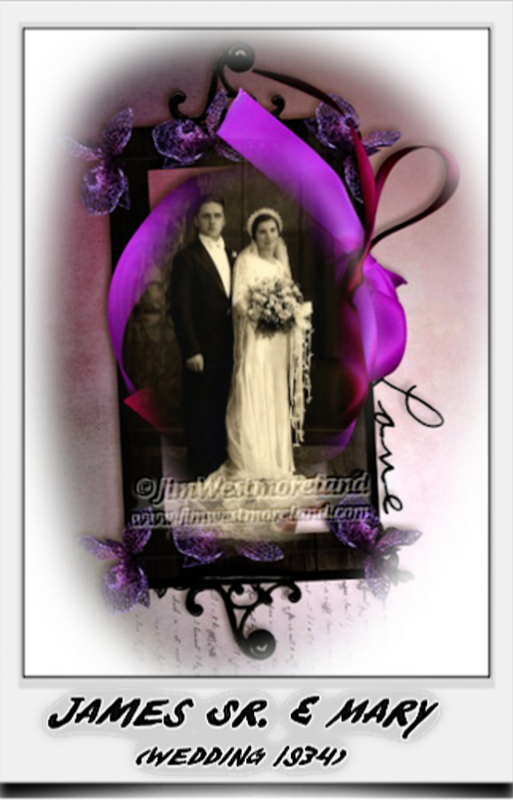 Jim’s mother Mary, met a dashing young man, James Westmoreland, in 1933. It wasn’t long before the two were inseparable and decided to take the walk down the aisle. The young couple was married, August 18, 1934. James Westmoreland, Sr., was a twin raised on a farm in Pittsburg, Tennessee. 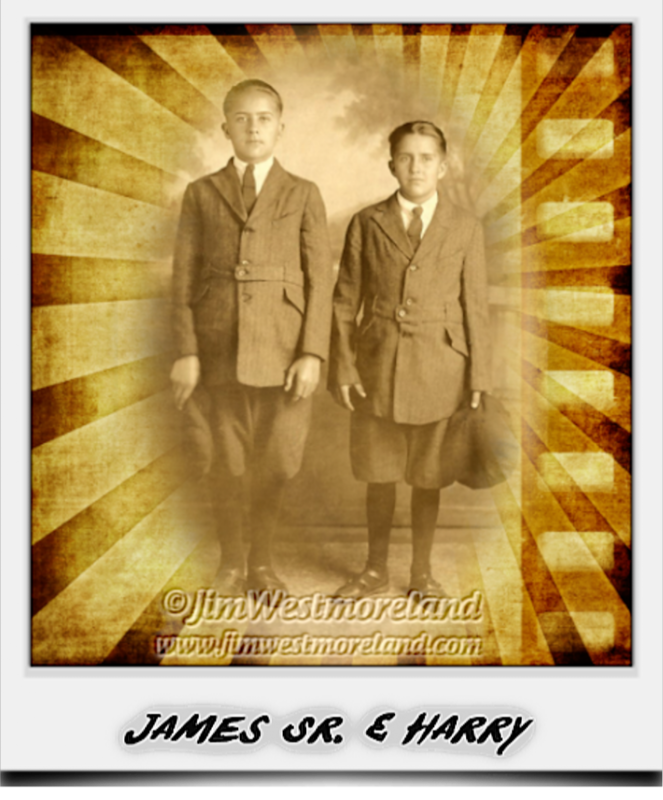 The twin boys, James and his brother Harry, had to quit school to help out on the farm, which was a common practice of the era. Harry had an accident as a young boy. Harry’s growth seemed to rapidly slow down after the accident and he was left with a limp. Harry grew up to become a master mechanic. James Sr. was a professional boxer for a few years in his early adulthood. He quit boxing while he still had his senses. This action lead to a successful career working at the Ford Motor Company. He worked hard and became a process engineer before retiring from Ford Motor Company. Jim was born a little over a year after the young couple married. 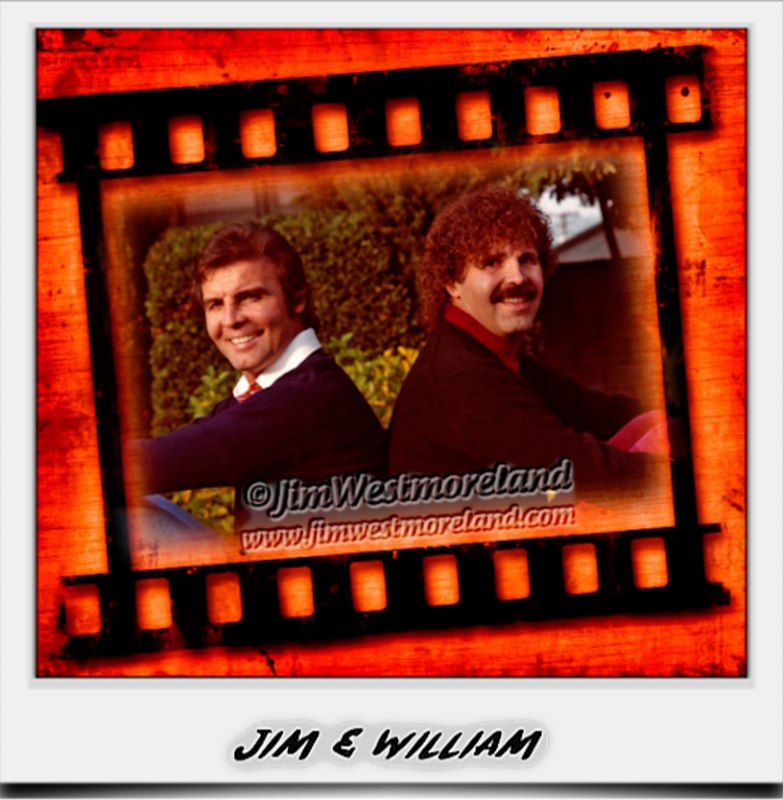 It was in November when Jim entered the world as the first born of the Westmoreland family and was quickly joined, a year and half later, by a brother, William. 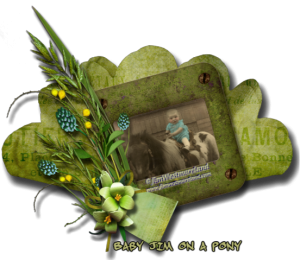 As the boys were growing into men, Jim and William enjoyed spending many weekends at their grandparents’ house in Dearborn, Michigan, staying occupied with the neighbor kids in the nearby park playing baseball and football. In High School, Jim, being an athletic boy, enjoyed being involved in all sports and excelling in all the games he would partake in. He was a good student who was specifically interested in mathematics. After Jim’s graduation from Cooley High School, at the tender age of 18, Jim decided to test his wings and fly from the nest. He landed in New York City where he met some new friends that helped him secure employment as a model. 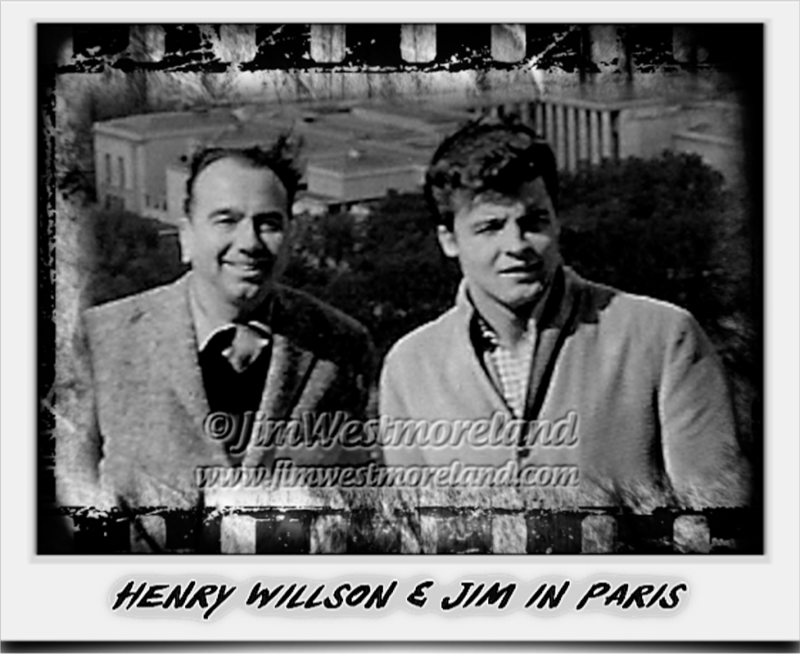 Jim was advised to go to Hollywood and was introduced to agent Henry Willson. Henry Willson was a well-known, legendary agent who molded the careers of Rock Hudson, Tab Hunter, Robert Wagner, Nick Adams, Guy Madison, Troy Donahue, Rory Calhoun, Clint Walker, Doug McClure, Ty Hardin, and Chad Everett, to name a few of his extraordinarily handsome clientele. Jim had two failed marriages, one in 1962 which lasted nearly 2 years, and one in 1970 to actress Kim Darby, which endured a stormy 3 months. After these two failed attempts at married life, Jim decided it would be best for him to stay single and “date”, which is what he has done to this day. 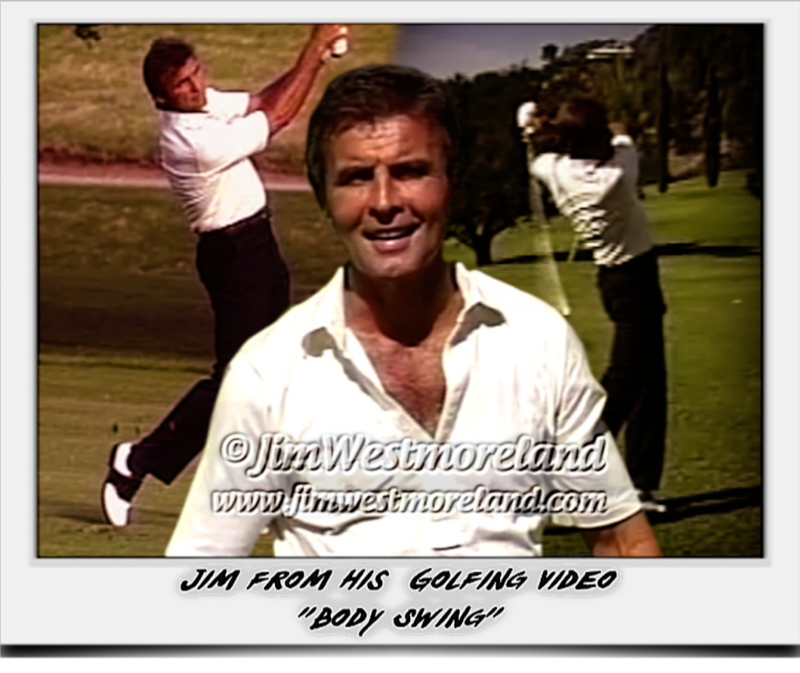 In the early 1970’s, Jim heard a calling to the sport of golf, which lead him to buy a home in Rancho Mirage, California. Rancho Mirage is a desert resort town near Palm Springs. Jim’s passion for the game propelled him to become the club champion at Canyon Country Club in 1972. He continued to perfect his game and had planned to become a touring professional. With some plans, life gets in the way and other roads are taken, which was the case with Jim’s golf touring circuit plans and becoming a professional in the sport of golf was not to be. He returned to Los Angeles to meet with the producer of General Hospital and he snagged the part of Teddy Holmes who arrived at General Hospital bed ridden from Serum Hepatitis, meaning, he was sick from shooting up with dirty needles while in Vietnam. The character turned out to be a great con artist and Jim played in about 150 episodes until health issues arose that ended Jim’s run playing that character, one of his favorites to portray. Several TV shows and another movie was completed as time quickly flew by while living and working in Los Angeles. Jim met Wanda White and the two of them produced a Golf Instructional Video titled, “Body Swing” with Jim starring while instructing his new golf techniques. His business partner, Wanda White handled all the business part of the show and Jim put the whole package together. They made Wanda’s investment back their first 3 months. Jim’s friendship with Wanda was unbreakable. They were a great team until Wanda was diagnosed with Leukemia and died a mere 3 months later. Jim was broken hearted after losing his trusted friend whom he admired immensely. In the year 2003, Jim picked up his broken heart and decided it was time to return to the desert to try his luck at playing in small Senior Golf Tournaments until he thought he was ready to move upward to pro status tournaments. He was good but he just couldn’t regain the game he once had, so he settled for competing in the Pepsi Tour and other senior tournaments. Jim continues to live a full and busy life. He is currently living in the desert as a novelist, completing two novels with a screenplay in the works. 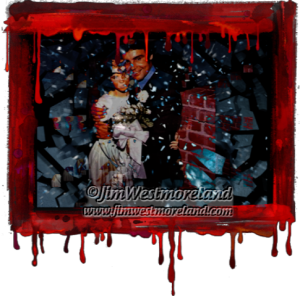 (Click here for information on Jim’s novels). Jim also stays busy enjoying the game of golf, dabbling as a golf instructor, and his new interests, blogging and the internet. *The daughters left behind died in Romania of old age. Their America born brother, George, was the only member of the family to have traveled to Romania to see them. By that time they were very old women. The daughters were never to have seen their mother, father, or baby sister again, nor were they to have met any of their American born sisters. I use your body swing all the time. This Frank, Peter Milo’s and your old buddy from Rancho. Would love to chat with you. I regret having to inform you that Jim passed away September 14th, 2016. I just now found this. Boo, all my old buddies are going upstairs. I knew him for years from Rancho Park in L.A. RIP my friend. Unfortunately, the longer we live the more we watch our friends and family leave us. Thank you for stopping by and leaving a comment. I was thirteen years old when I discovered this handsome actor. I was watching the television show, The Monroes, and onto the screen rode Ruel Jaxon. I was smitten and I made sure I never missed an episode. I wrote a fan letter to Jim Westmoreland never thinking I would receive a reply, but I did. 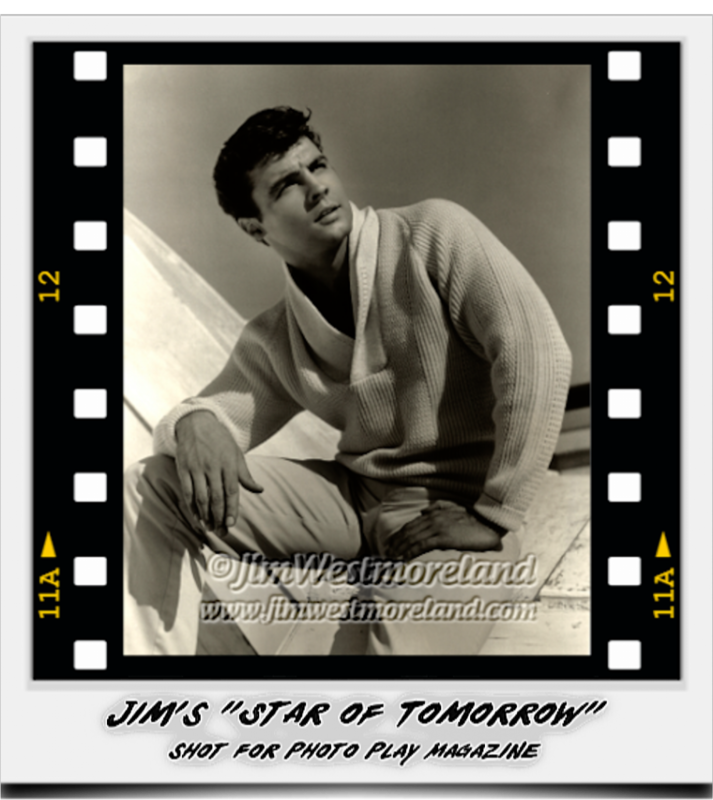 A manila envelope was delivered one day and inside of it was a glossy 9 by 11 photo of Jim with a small typewritten note thanking me for taking the time to write him a letter and that stating that he was pleased that I enjoyed his performances on The Monroes. The photo was autographed and he had personally signed the typed note. I wish I had found this wonderful site before Jim’s passing. I would have liked to have written to him again and to have told him that I still have these treasured items and that I never forgot him. He might have gotten a kick of of that. I purchased The Monroes DVD set recently and I am enjoying watching by favorite show and my favorite actor again. Thank you for letting me share this special memory. I wish you would have found this site earlier too so you could have told Jim your story. He would have loved it! I’m sure Jim typed that letter to you. That was what he did. I should have asked him why he typed them instead of writing since he had such beautiful handwriting. Thank you for sharing your memory with those who happen by. Thank you for your kind reply to my post. I really appreciate your added thoughts and insight. After reading Jim’s stories, written in his own words, his kindness and thoughtfulness toward others is extremely apparent. How lucky you were to have known him! And I am sure he felt the same way about you. Thank you for all you do to maintain this website and to help keep Jim’s memory alive.